Many foreign individuals desire to obtain their college degrees in the United States. Sobel & Erwin Oklahoma student visa attorneys have assisted hundreds of foreign students in achieving their education goals of obtaining their university degrees here in the U.S.
To get started on your case right now give us a call at 918-712-9888. Let us start working on your Oklahoma student visa case immediately. You must have an F-1 visa if you desire to further your education in the United States, and you must have a residence outside the U.S. that you plan to maintain. You must be financially independent without the need to become employed or the need to obtain any type of financial assistance from the United States. You must be able to speak and comprehend the English language or enrolled in an English language course for English proficiency. You must be enrolled in a college or university as a full-time student, and meet all academic and enrollment requirements at that institution. The U.S. Citizenship and Immigration Services must approve your choice of a college or university. You must have a consular interview (this is part of the application process. We assist our clients in this area of their preparation to support their student visa application). Obtaining the wise counsel of Sobel & Erwin, an experienced team of Oklahoma student visa attorneys, will assist you in avoiding delays in securing your student visa, and also in successfully achieving your educational goals. Sobel & Erwin will partner with you throughout this often complicated and confusing process. Contact Oklahoma student visas attorneys at Sobel & Erwin in Tulsa, OK today to begin the process of obtaining your student visa. We will provide you with the legal expertise so important in this area of ensuring that you are able to attend the college or university of your dreams. 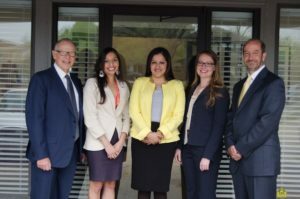 While it is a complicated process and difficult to navigate without the expert advice of legal counsel, the Tulsa, OK immigration law firm of Sobel & Erwin has assisted numerous foreign individuals in successfully obtaining their student visas. Let them help you. Call 918-712-9888 or fill out our online contact form now.